The LED Double Linear High Bay can produce the perfect glare-free lighting to places such as workshops, warehouses, shopping malls, garages, lobbies and other similar places. 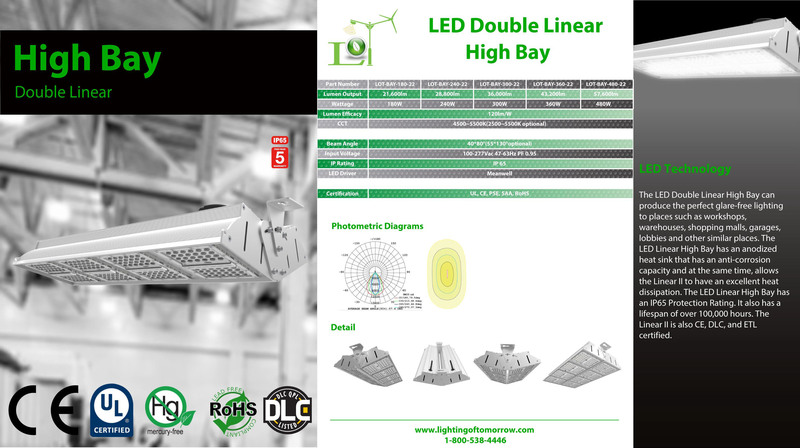 The LED Linear High Bay has an anodized heat sink that has an anti-corrosion capacity and at the same time, allows the Linear II to have an excellent heat dissipation. The LED Linear High Bay has an IP65 Protection Rating. It also has a lifespan of over 100,000 hours. The Linear II is also CE, DLC, and ETL certified.